Nearly 41 million Americans were impoverished in 2016, and the United States continues to have one of the highest poverty rates of any OECD nation. 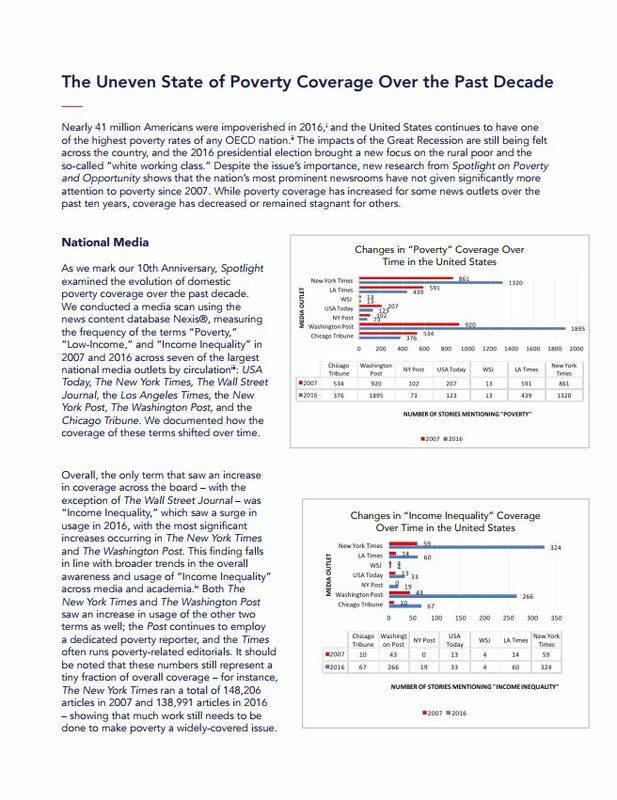 The impacts of the Great Recession are still being felt across the country, and the 2016 presidential election brought a new focus on the rural poor and the so-called “white working class.” Despite the issue’s importance, new research from Spotlight on Poverty and Opportunity shows that the nation’s most prominent newsrooms have not given significantly more attention to poverty since 2007. While poverty coverage has increased for some news outlets over the past ten years, coverage has decreased or remained stagnant for others. Check out the memo for more information.